So I expect Petra is not going to sack Shannon! When I'm cycle touring, I'm too busy having The Fun to brush out my zippers. Unless I'm camping in a desert made of ground up carborundum stone, I fail to see why this should be necessary at all. It also suggests using a tent with a heavier fabric in extremely strong sun, for better resistance to UV. I've never felt the need to brush out my tent zippers, even in the Mojave Desert, but I suppose in a windy and dusty enough environment it probably wouldn't be a bad idea. Probably over 20 years old, they take a rather specific gas bottle that is like hens teeth in the UK and expensive (and not long lasting) to boot. Not exactly backpackable but will do wonderfully for things like car camping and remote audax controls/time trials etc. The up-market tent pegs that I bought as replacements for the rubbish supplied with my Wild Country Zephyros 1 tent arrived today. They need to be tested. Thanks to AndrewC for the recommendation. They look to be the bees' knees. I could probably fit the stove to Worf the trailer. Mobile tea bike I like the idea of that.. If I swap the big tank for a little one, it would be the ideal rally trailer for next year. 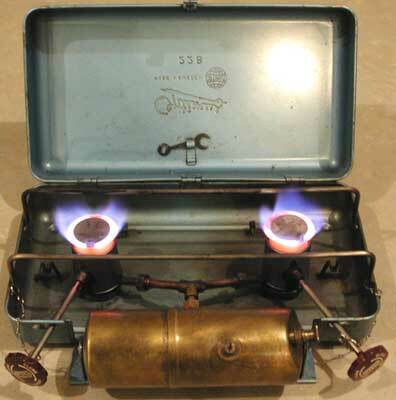 I have a hankering for the "proper" version of that, the liquid fuelled-suitcase stove. Ugly as sin with a separate fuel tank. If so, we've got one and it's great. Yes, the Pikes were raving about it. It costs the equivalent of about fifty quid in the USA but £110 here. Somewhere I have a optimus 22B, unfortunately with a crack in the fuel tank. It sounds like a jet engine, runs astonishingly well and is definitely a beast that should not be left in the charge of timid hands. Much fun was had with this. It can burn a 5l pot of porrige before the top is even noticeably warm. It was nicknamed the whisperloud in the uni climbing club. One time in cornwall we had stopepd to cook supper. I think we were just down the road from Zennor. It was raining, blowing a gale and we set the stove up inside the shelter of an old mine building near the road. Sitting in the minibus with the rain pouring we could still hear the thing. I have an Optimus normal 'primus' type paraffin stove, that is still in use. It goes like a rocket, and will face down a petrol stove in a boil-off! But also totally controllable by letting off the pressure, or pumping it up. Everyone needs to learn how to use a proper primed paraffin stove! It's an education by fire if you get it wrong, and pump it up to soon and send liquid paraffin out the jet causing a 10-foot high yellow flare. Which will set your tent on fire if you are foolish enough to try this in the bell-end as an inexperienced primunaut. But it is a wee bit wind-sensitive. I must try to find it. I think my dad had it to do some silver soldering on the tank (which I now have the capability to do and a stick of silver solder somewhere). It is definitely an outdoors and a long way away from anything remotely flammable tool though. It can burn a 5l pot of porrige before the top is even noticeably warm. In my experience of porridge-making, which is reasonably extensive, it takes a modicum of care and effort not to burn any quantity of porridge on a naked flame. 5 litres of the stuff is asking for trouble. http://www.flickr.com/photos/andrewclark/7875719102/sizes/m/in/set-72157631278357270/ shows the desired technique. But these babies burn *paraffin*. It's not at all like burning petrol. Paraffin requires the skill and finesse of one who knows how to prime the stove, and can tell when the loop has vapourised and can begin to pump up the pressure. This truly is a skill that is learnt with the removal of eyebrows. Paraffin stoves are truly in the 733t category. I duuno, I'm all for a bit of pyromania. It's just that I'd rather keep that separate from cooking. Especially near a tent. Hmm.. I have a slight aversion to setting fire to things that which shouldn't be on fire. This includes at one point a minibus that shouldn't have been set alight. And a few other incidents and eyebrows. Paraffin stoves are the preserve of the elite. None of this simple stuff but the real chance to have major conflagrations. And to scare the beejesus out of the novices. I'm probably foolish enough now to risk a primus within 20m of a tent. If I had one. The petrol versions also require a bit of preheating but nowhere near the same grade of knack. There is a deep pleasure in being able to work a old brass primus stove. It's not difficult, but just requires a bit of learning. And a bit of experience. Once you have mastered it, they are both fearsomly hot, and also superbly controllable. I'm an old enough hand at this that I will light a cold primus in the bell-end of a tent if it's windy. But the outer flysheet must be open enough to allow me to throw the thing into orbit if it flares up. Personally I wouldn't light paraffin in my bell-end, but the Pikes will do all sorts of things in the name of a good show. 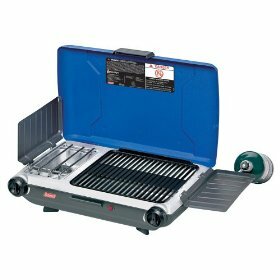 The experience you get with a primus is usually just after you really needed it..